What do you do with all your old laptops and PCs? It is a particularly pertinent question around Christmas time, as this is the time of year when many people get to upgrade their home PC and laptop kit. 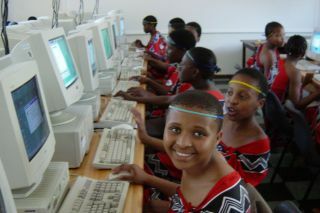 Computer Aid is a UK charity that specialises in repurposing old technology and computers, making good use of (what we in the UK consider to be) used and spent tech in in countries such as Zambia, Chile and Madagascar. "Data-wiped to the highest standard, at no cost to you, Computer Aid will ensure your old PC or laptop finds a home in a school, hospital or community centre to help enrich education, improve employment prospects and enhance healthcare," reads the charity's Xmas press announcement. Put like that, it really is hard to find any fault in what Computer Aid is doing. "Donating your old PCs and laptops to Computer Aid will also help you to navigate the legislative mine field of how to correctly dispose of IT equipment, as Computer Aid is a government-approved organisation for handling Waste Electrical and Electronic Equipment (WEEE). "It's likely that this Christmas many households will find themselves with old computer equipment they no longer need," says Louise Richards, CEO of Computer Aid International. "Computer Aid makes it very simple for people to donate these unwanted PCs and laptops. In doing so they can make an enormous difference to the lives of people in the developing world, while ensuring they are acting responsible in the disposal of their electrical waste." To date, UK organisations and individuals have donated more than 135,000 PCs and laptops to Computer Aid, for e-health, e-inclusion, e-learning and e-agriculture projects in more than 100 countries. If you want to know more, check out Computer Aid's promo video, which highlights the work that this vital UK charity is carrying out.